Indoor grilling is a perfect way to have your tasty foods even when outdoor grilling is limited. It could be bad weather like intense snowfall, limited outdoor space or just city codes or regulations that restrict outdoor cooking in your living area. High-rise, downtown-style accommodation lends itself to a host of limitations and outdoor cooking restrictions. If you are busy and don't have either the time or desire for the rigors of outdoor grilling, take heart. There are ways to overcome this and enjoy your grilled delights using indoor grills. 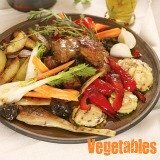 You may also explore quick and easy indoor grilling meals and recipe ideas to keep your palate captivated. There are several ways of indoor grilling. All you need is a heat source. The main heat source indoors is going to be electric. Gas burners and firewood have their application here too, as you will see. Charcoal grilling is highly restricted indoors because of safety and gas emission issues. As you tread along, feel free to sample a variety of grilling tips to enhance your indoor grilling experience. The absence of both real smoke flavoring indoors and open charcoal flames for caramelization means that you have to step up the spices, seasoning and marinating game with indoor grilling to compensate. You can also infuse different smoke flavors by using liquid smoke. If you want to get real smoke flavor, you can even smoke food indoors. There are proven ways to do that as well. In order to allow more flavor to penetrate your meat during flavoring, you may need to trim off more of the excess fat from the meat. Trimming fat also helps to reduce the amount of smoke that will be emitted while indoor grilling. Griddling is coined from the use of a griddle. Griddling is also known in some quarters as char grilling. One way to 'griddle' is by using a ridged pan on high heat over a gas or electric burner. The food is cooked by conduction. All griddle foods have to be flipped to cook on the 'flip' side. Patio grilling is a variation of the indoor grilling 'method'. The cooking is done just outside the main building like on a patio, deck, porch or balcony. Some high rise, in-town, condo-style dwellings have a pool or deck area on a low or upper level where patio grilling can be done. 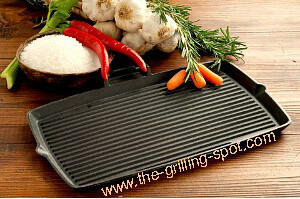 Indoor grilling equipment is used on the patio or deck because of the proximity to the main building or house. There are critical safety considerations to be made when using open flames to grill adjacent to a house or building. All in all, indoor grilling is a very viable way of enjoying our tasty delelectables indoors! 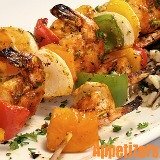 Grilling Tips - Find 35 time-tested grilling tips to experience tasty mouth-watering foods! Charcoal Chimney Method - The cheapest, safest and most efficient way to light a charcoal grill. Lump Charcoal vs Briquettes - A candid comparison between lump charcoal and charcoal briquettes. 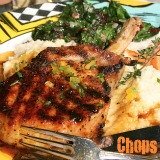 Wood Flavors - Use wood chips and step up the grilling game with new flavor blends.